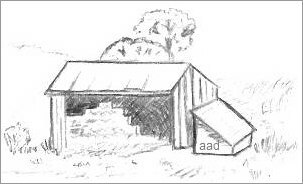 Do you have an old barn drawing in your reference clippings that is a favorite for you? I encourage all trainee artists to attempt to draw a barn at least once in their first year. I was drawing for about 7 months when I created the images on this page so they are not works of art but they do show what's possible even if you truly doubt your abilities. I've been in your shoes and the growth of confidence is a process but it does happen, so please be patient. I was quite elated when I did the following old barn drawing from memory because that's something I never thought I'd be able to do, let alone be able to illustrate a barn! 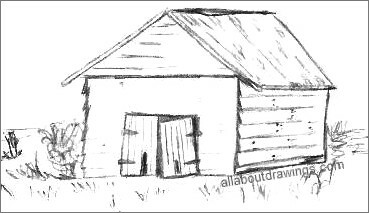 I saw a dilapidated barn when we went for a drive in the country one weekend so as soon as I arrived home, I sketched out a quick outline to remind me of its simplicity and character. At the time of drawing it, I had no idea about perspective so it's all guesswork, but at the time I remember being thrilled with the outcome of the sketch. This barn was sitting on an empty block of land and it resembled a sad reminder of days long gone. A little bit more of a story was added to the overall picture by the way the doors were hanging from their hinges. I was driving so I had no time to note how many boards were between the top of the doors and the roof of the shed -- I could have used this information to help me achieve better proportions. In my drawing, the front is depicted with lines for the boards but I must have drawn them too lightly for them to scan properly. Now it's your turn to have a go, so with your favorite barn picture in hand, just lightly sketch in the outline of the barn. To help you create the image you have in mind, keep going over the lines until they feel and look right to you. Next, draw in the panels and decide whether you want your barn drawing to have a door or just an opening. It's your choice whether you add in shadows and if you do, just refer to your picture which shows the areas that require shading. An artist can add or omit this effect but remember to always add all shadow opposite the source of light. The trees and grass can be made up of all different strokes so have fun with it and experiment to find which style you like. Never believe that a few caring people can't change the world for indeed, they are the only ones who ever have. In the pencil drawing of an old barn below, I added a horse shoe on the ledge inside the door because my Dad has an old shed and when I go in there, it's the first thing I see. It's a consistent theme with most old barns along with an assortment of bottles, cans and odds and ends - generally things that the owner thinks will come in handy one day! Are You Searching For A Hobby? If you have always wanted to draw, now is a good time to get constructive and see how you fare designing some old barn drawings. All of these illustrations were created when I was such a novice and that's so obvious in all of these illustrations! However, I want to show you what I drew at an early stage so you can see it's quite possible for you to do the same or better. I also drew a lot of images without a border (like the one above) and I have to say it's still a habit because I feel restricted with borders. I'm sure it's a confidence thing so I hope to grow out of it. Once you start studying pencil artwork, you soon discover that an image consists of just a series of lines - and you get to decide how you want to construct them. I am proud to be a self taught artist but at this stage I'm not about to try and teach you all about perspective or anything like that. 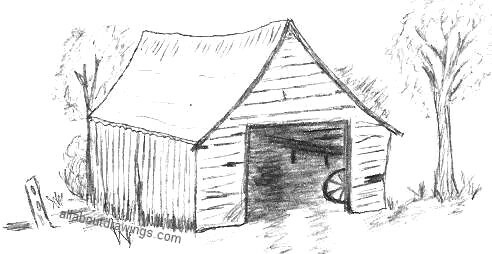 I am here to encourage you to start drawing and it is only a suggestion that you start with old barn drawings. Draw things that interest you and you will do very well. 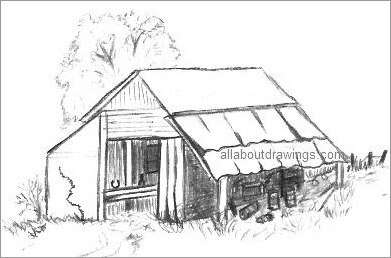 This is my sketch of a typical hay barn. How many times have you driven past a farm and you see all the hay stacked up in the barn like this? Next time you go driving, take a sketch pad and 2B pencil with you. A mechanical pencil with 2B lead is great for travelling because you don't need to sharpen it. You only need to do rough outlines while you are out and use your inspiration (or reference pictures) to complete the drawing once you are back home. My images are too light because the strokes are tentative but this is natural when you start drawing so please allow yourself time to become confident and sure. Old barn drawings make a great frameable piece of art because of their character so be sure to ask your family or friends which is their favorite and then frame the one that wins the vote. It can be a popular gift or a nice addition to your home.